Contrary to what the name suggests, Scrobbles is not a scrobbler app for Last.fm. In fact, it does the exact opposite of what a scrobbler client does. Instead of sending data to Last.fm about what you’re currently listening to, Scrobbles will read from Last.fm and display relevant information about what you are currently listening to. When information about Scrobbles first landed in my inbox, I was quick to dismiss it. But going through my emails thanks to Mailbox, I realized what a nifty little tool Scrobbles really was. 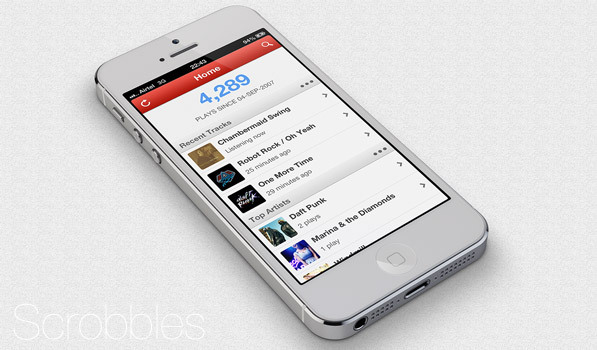 Scrobbles is an iPhone app that reads your Last.fm profile and displays all the relevant information for you. It has a very pleasant, subtly wonderful UI and I instantly liked. On the main screen, it displays the total ‘plays’ your account has had since you signed up for the service. Below that, it displays your Recently played Tracks, Top Artists, Top Tracks and Top Albums. You can dig deeper into each section and view a long, continuously loading list of tracks. Tapping on a track reveals information like name of Artist, No. of plays, No. of listeners, length, track no. and the album it is from. There’s also a long description about the track, taken from various sources. You can also view an artist’s profile in the app, along with information like the artist’s most popular tracks, similar artists and even his upcoming events. In the Artist Profile view, Scrobbles has a nice animated photo background with photos of the artist displayed with a Ken Burns effect. Looks great! You can also search for an artist directly from Last.fm. To use the app, you only need to provide it with your Last.fm username since it only reads from your profile. However, it also includes an option to “Love” tracks on Last.fm, which requires providing it with your password as well. Scrobbles has a very simple, pleasant look to it. It doesn’t try to be overly shiny at what it does, which is what I like about it. Spotify allows me to subscribe to playlists created by others and explore some great new artists via apps like Fliptape. This way, Scrobbles is a nifty tool to discover about all those new articles I may have listened to. It does “one thing, but one thing well” and is available on the App Store for just $0.99.